A NEW BOOK FROM MISTER YETI!! IT'S SHY YETI'S BESTEST VERSE! Here we are for episode 181 - and in a change from the advertised programme we have an impromptu LIVE show on Pride48! We have guests - my niece, Alena - over from the States and also top fashionista, Anastaaaaasia Anastasia who Yeti Uncle John attempts to interview and Cromitty regresses back to a past life. Pretty normal stuff - but do please take a listen anyway! Our next show, #182 sees us returning to the originally scheduled edition in which we learn all about Charisma - Charlie Grrr's former pie-love! Do join us, won't you?! Please email me at shyyeti@yahoo.co.uk if you have any comments - you can even send me a sound-file and I'll include it on the show. The music is by Shy Yeti and Luca. Sound effects by Paul Chandler. All content of this episode is Copyright Paul Chandler, 2018. Episode 181 was recorded LIVE on Sunday 8th July 2018. Here we are for episode 182 - in which we hear all about Charlie Grrr's current dating situation before learning about another occasion where Charlie got extra close to a pie named Charisma - an association which ended in heartbreak. We hear from the regulars - there are also poems and a 1995 Sutton Park clip. Our next episode, number 183 sees us heading back onto the airwaves for July's OFFICIAL live edition - where Paul will be baby-sitting the peepers. Do join us, won't you?! Please email me at shyyeti@yahoo.co.uk if you have any comments - you can even send me a sound-file and I'll include it on the show. The music is by Shy Yeti and Luca. Sound effects by Paul Chandler. All content of this episode is Copyright Paul Chandler, 2018. Episode 182 was recorded between the 26th and the 29th March 2018, with additional material recorded on the 14th and 15th July 2018. Our SUTTON PARK clip comes from episodes 1021 and 1022; filmed during the Summer of 1995. We had a second live episode for July - this one our official third Sunday of the month edition - we had friends in the chat-room and all of us were given the responsibility of baby-sitting Ikk's pet peepers! Here we are for episode 183 - in which we head out into Pride48 LIVE for our official July edition (aside from our surprise live edition from last weekend!) This time Paul has been asked to mind the peepers whilst Ikk is away for the weekend - but, as one might imagine, things do not necessarily go so smoothly. Will Cromitty and Yeti Uncle John be able to help juggle this responsibility with manning the chat-room. All this and there are after-show extras. Our next episode, number 184 sees Ikk working towards opening a dating agency - can some friends of the show give him some advice? Do join us, won't you?! Please email me at shyyeti@yahoo.co.uk if you have any comments - you can even send me a sound-file and I'll include it on the show. The music is by Shy Yeti and Luca. Sound effects by Paul Chandler. All content of this episode is Copyright Paul Chandler, 2018. Episode 183 was broadcast LIVE on Sunday 15th July 2018, with extra material recorded during Summer 2018 and a brief SUTTON PARK clip from the mid-1990s. 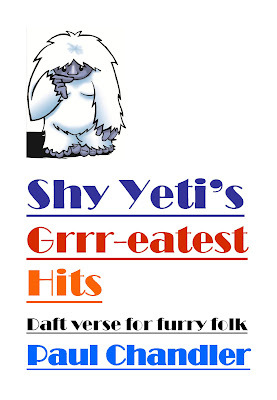 SHY YETI’S GRRR-EATEST HITS! is a Mr Yeti’s updated “Best Of” compilation of his own verse and short prose; written and performed for your joy since 1992 – on radio, in podcasts, on video and at poetry events. These include BEING COY, THE CAFFEINE QUEEN, DISCO YETI, GRANNY ETHEL, I WILL EAT PIE, THE TRUE LIGHT, UNGRATEFUL VALENTINE and many more… 256 Pages. July is speeding on for THE SHY LIFE PODCAST - and the following shows are the ones that are coming up next... We're also recording new episodes along the way and so this list tends to change every time I post here. Big event episodes coming up include our tribute to the Pride48 New Orleans event in August and our very own episode 200 which should be coming up by September; we have a new theme tune for you then too! Anyway, here is the schedule as it stands today! Ikk has decided to start a dating agency - but wants to pilot some ideal questions with the regulars; also seeking advice for listeners about their own dating advice. Paul embarks on a flight of fancy where he wonders what things would be like if he had never left SUTTON PARK back in the 1990s. 187. The Yeti And The Narcissist! Paul catches up with his niece, Alena and they take a test to see how narcissistic they are... Not only do they discover that some of the questions are difficult to answer - but also, surprisingly - that it's not all about them!! 188. Look Into My Eyes... On The Radio!?! In which Paul seeks hypnotic help from Cromitty before heading onto the radio - but Zap has plans to turn his poetic plans into utter chaos - live over the airwaves!! We're live and on the air for our July show - with lots of extra material for the podcast version of the episode! 195. ...And Suddenly It Was 1988!